Kiwi director Taika Waititi of “Boy” and “What We Do In the Shadows” fame will shortly be stepping into the big leagues directing the next “Thor” movie. In the meantime he has conjured up another slice of real Kiwi life on a budget that would probably fail to cover the catering bill for his new movie. Waititi translates Kiwi writer Barry Crump’s book into a screenplay full of Kiwiana, irony and humour. We meet Ricky Baker (Julian Dennison) as the local police (Oscar Kightley) and “enthusiastic” child care worker “Paula” (Rachel House), attempt to rehouse the young Maori lad with his new adoptive foster parents. “Aunt Bella” (Rima Te Wiata), child loving and with a heart of gold together with husband “Hec” (Sam Neill), a loner bushman with little desire to house a young delinquent. Ricky’s long list of offences are mentioned, including “smashing stuff and throwing rocks” but Paula is very determined, oft repeating her personal motto, “no child left behind”. The opening scene sets the tone perfectly, as Ricky carefully surveys his new accommodation and then quietly returns to the police car. Despite finding his new basic rural surroundings somewhat bewildering, including a gloriously bloody wild pig hunt, Ricky starts to become part of the family as he is showered by Aunt Bella’s practical love and understanding. Following an event, Ricky and Hec strike out on their own into the New Zealand bush as a national man hunt for the pair commences. Can they get on, will Hec’s heart eventually melt, if indeed he can find it? This is a comedy drama with emphasis on the humour with incompetent hunters, crazy bushmen (Rhys Darby) and comical situations. However framed with underlying sadness and a serious story under pinning the whole endeavour. The tone is reminiscent of director Waititi’s’ “Boy” and manages to stay consistent throughout. Waititi even allowing himself a brief cameo, to great comedic effect. There are plenty of belly laughs for those that understand and know New Zealand well. Neill essaying your everyday “she’ll be right” Kiwi bloke, whilst providing a much needed straight man to all the shenanigans. Some scenes are pushed too far, with Paula’s quest going to ridiculous length’s for the sake of comedy and Darby overbalancing his scenes with his usual shtick. Somehow with the solid anchor of Dennison’s fresh performance and Neill’s experience, the ship manages to stay the right way up. The New Zealand bush is shown in all it’s glory with the addition of a great choral track to accompany the shots of the overhead tree canopy. Overall a much more approachable and enjoyable film than “Shadows” which will play especially well with Kiwi’s and Australians but does have broader appeal. Hugely enjoyable comedy adventure with serious undertones and represents a real return to form for Waititi. 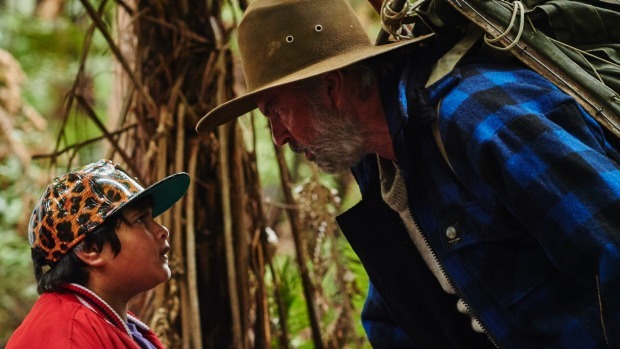 It’s also great to see Sam Neill on the big screen again, opposite a great new young talent.